The short list for the RSL Ondaatje Prize was announced last night, at the end of a fascinating session at the British Library in London in which four former winners of the prize talked of “the spirit of a place” and how they set about evoking it. Kings of the Yukon by Adam Weymouth (Particular Books/Penguin). The British Library session was recorded for BBC Radio 3’s “Free Thinking” slot, and is due to be broadcast on May 1. The short list is due to be announced at the British Library in London tomorrow evening for the Royal Society of Literature’s Ondaatje Prize, an award of £10,000 for a work that evokes “the spirit of a place”. In a session titled “Traversing Parallels: Literature of Place”, Malachy Tallack, author of Sixty Degrees North and, most recently, the novel The Valley at the Centre of the World, which has been long-listed for the 2019 RSL Ondaatje Prize, will be in conversation with Manchán Magan, who has written books on his travels in Africa, India and South America and two novels. The poet Jen Hadfield will read from new work and old (including Byssus and the TS Eliot Prize-winning Nigh-No-Place) that explores the natural world and ideas of home. Ann Cleeves will be in conversation about her series of Shetland novels (inspiration for the TV drama starring Douglas Henshall as DI Jimmy Perez), the eighth and last of which, Wild Fire, was published in 2018. Robin A Crawford will be discussing and reading from Into the Peatlands: A Journey Through the Moorland Year; Sarah Maine will be in conversation about character and the power of place, with readings from The House Between Tides and Women of the Dunes; and James and Tom Morton will entertain with stories, readings and a few songs/poems about Shetland, “along with some father/son quarrelling/banter (and possibly a bit of cooking… )”. Horatio Clare will be talking about his latest book, The Light in the Dark: A Winter Journal and about Down to the Sea in Ships, which won him the 2015 Stanford Dolman Travel Book of the Year Award. Huw Lewis Jones, editor of The Writer’s Map, will be talking to Kiran Millwood Hargrave and Piers Torday about the maps that have inspired them. Isabella Tree talks about her latest book, Wilding (long-listed for the RSL Ondaatje Prize), the story of a pioneering rewilding project in West Sussex using free-roaming grazing animals to create new habitats for wildlife. Kapka Kassabova, author of Border: A Journey to the Edge of Europe, which was Stanford Dolman Travel Book of the Year for 2017, talks to Misha Glenny, former Central Europe correspondent for the BBC (whose own books include The Balkans, The Fall of Yugoslavia and, more recently, McMafia). In a session billed as “Che Guevara to Juan Guaidó: Understanding Latin America”, Jon Lee Anderson of The New Yorker talks to Sophie Hughes to introduce the graphic version of his biography Che Guevara: A Revolutionary Life and explain what’s happening today in Venezuela. Robert Macfarlane, whose latest book, Underland: A Deep Time Journey, will be published on May 2, will be interviewed by Horatio Clare (who will himself be speaking later on — see below). In a session titled “Woodlands Past and Future Forests”, the arborists George Peterkin and Archie Miles discuss the state of woodland with Natalie Buttress, director of Woodland Trust Wales, and Sandi Toksvig, ambassador for the Woodland Trust. Monisha Rajesh, author of Around the World in 80 Trains, talks about her 45,000-mile adventure on the rails. John Simpson, BBC world affairs editor, talks about his new thriller “and the way in which, in fact as in fiction, so many of the most improbable or extraordinary stories and trails all lead back to Moscow”. He will be interviewed by Oliver Bullough, whose own books include The Last Man in Russia and Moneyland. Drawing on the Literary Atlas project, academics from Cardiff University and the University of Wales — Jon Anderson, Mary-Ann Constantine and Damian Walford Davies — explore the relations between literature and landscape. Alice Morrison (presenter of the BBC Two series Morocco to Timbuktu), who went to Morocco to run the Marathon des Sables and stayed on, talks about her latest book, My 1001 Nights: Tales and Adventures from Morocco (due to be published by Simon and Schuster on April 18). Erling Kagge, the philosophical Norwegian adventurer and bestselling author of Silence in the Age of Noise, discusses his new book, Walking: One Step at a Time, with Dylan Moore. In a separate session on the same theme, Kate Humble will be talking about her latest book, Thinking On My Feet. The travel writer Nicholas Jubber talks about his Epic Continent (which John Murray is due to publish on May 16), in which he explores the impact of poems, from The Odyssey to the Serbian Kosovo Cycle, on identity in Europe. Raynor Winn talks to Claire Armitstead about The Salt Path, the story of how Winn and her terminally ill husband, having lost their home and their livelihood, set off to walk the South West Coast Path. Peter Frankopan talks about The New Silk Roads, “a timely reminder that we live in a world that is profoundly interconnected”. Horatio Clare, whose books include Something of His Art: Walking to Lübeck with JS Bach, The Light in the Dark: A Winter Journal and Running for the Hills, will look at writers inspired by the Welsh border landscape, including Coleridge, the Wordsworths, Bruce Chatwin and David Jones, and explore what it means to walk in the footsteps of writers and walkers. André Aciman’s Out of Egypt, the extended story of an extended Jewish family in Alexandria in the first half of the 20th century, has recently been published in Britain (Faber & Faber). It’s a dazzling period piece — but a timely and essential read too. My review appeared in The Daily Telegraph on Saturday; you can read it here on Deskbound Traveller. Deskbound Traveller has now been doing its bit to promote the best writing on travel and place for more than five years. If you’ve been reading it even for a little of that time, you might know that one of my favourite literary awards is the Ondaatje Prize of the Royal Society of Literature. It’s an annual prize of £10,000, made for a work of fiction, non-fiction or poetry that “evokes the spirit of a place”. The Ondaatje — sponsored by Sir Christopher Ondaatje, the businessman, adventurer and writer — has been going a little longer than this site, and in 2019, 15 years on from the first award, the society is adding a few frills. For the first time, there will be a long list, which will be published on March 26. 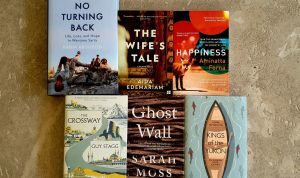 A short list (it’s usually of six books) will follow on April 16, after an event at the British Library, in London, where four previous winners will speak on “the challenges and delights” of trying to summon the spirit of a place. The writers are Pascale Petit, who last year became the first poet to win, with Mama Amazonica, which tells the story of her mother’s mental illness and her own damaged childhood while celebrating the fragile beauty of the rainforest; Peter Pomerantsev, whose Nothing is True and Everything is Possible is an electrifying portrait of Putin’s Russia; Alan Johnson, former Home Secretary, whose This Boy is a memoir of poverty in post-war London; and Hisham Matar, whose debut novel, In the Country of Men, is narrated by another boy, one growing up under the repression of Gaddafi’s Libya. The event will be chaired by the presenter Eleanor Rosamund Barraclough and broadcast by Radio 3’s Free Thinking programme and available as an Arts & Ideas podcast. Members of the RSL may book through the society’s website; non-members will be able to book through the British Library site from March 8. The judges for this year’s prize are Sabrina Mahfouz, Michèle Roberts and Ian Thomson (who in 2010 won not only the Ondaatje but also the Dolman Travel Book Award for The Dead Yard: Tales of Modern Jamaica). The winner will be announced, as usual, at a dinner in the Travellers’ Club in London, to be held on May 13. 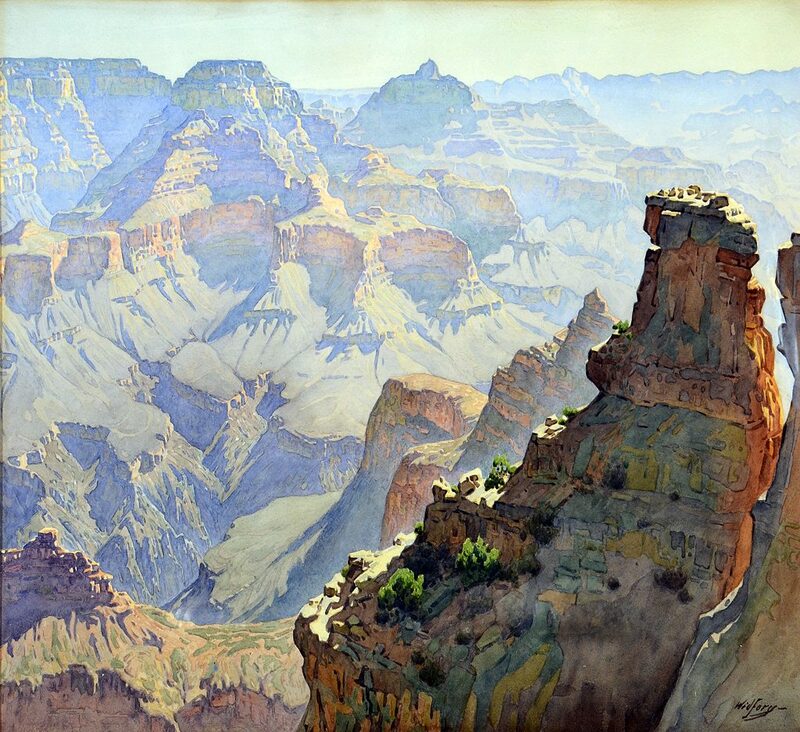 It’s nearly a century (February 26, 1919) since the Grand Canyon became a national park. One of the people who did most to promote it in its early days was a Swedish watercolour painter, Gunnar Widforss, and to mark the anniversary I’ve been following the Widforss trail for Telegraph Travel. It was a book that prompted my pilgrimage: The Art of Flying by Fredrik Sjöberg, another Swede. You can read an extract from that on Deskbound Traveller. To find out more about the artist, see the Gunnar Widforss Catalogue Raisonné Project, established by Alan Petersen, curator of fine arts at the Museum of Northern Arizona, Flagstaff. “100 Years of Grand”, a project of Arizona State University, Northern Arizona University and Grand Canyon National Park, brings together thousand of photographs, documents and correspondence relating to the park’s history. William Atkins, whose The Immeasurable World (Faber & Faber) was short-listed last week for the Stanford Dolman Prize, will be talking at the Royal Geographical Society in London on Monday, February 4 (members only), about deserts and their grip on the imagination. Until April 2018, I’d never set foot in New Orleans, but I’d travelled there — and to other parts of Louisiana — countless times in the pages of the great James Lee Burke. Burke’s latest Detective Robicheaux story, The New Iberia Blues, is due out on January 10, and the author has been talking to The New York Times about his own reading, how he got hooked on crime fiction and what makes a good mystery.